This article is about the federal electoral district. For the provincial electoral district, see Toronto Centre (provincial electoral district). Toronto Centre (French: Toronto-Centre) is a federal electoral district in Toronto, Ontario, Canada, that has been represented in the House of Commons of Canada from 1872 to 1925, and since 1935, under the names Centre Toronto (1872–1903), Toronto Centre (1903–1925, and since 2004), Rosedale (1935–1997), and Toronto Centre—Rosedale (1997–2004). Toronto Centre covers the heart of Downtown Toronto. 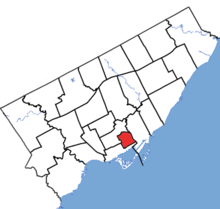 The riding contains areas such as Regent Park (Canada's first and largest social housing development), St. James Town (a largely immigrant area and the most densely populated neighbourhood in Canada), Cabbagetown, Church and Wellesley (Canada's largest gay neighbourhood), Ryerson University, The Toronto Eaton Centre and part of the city's financial district (the east side of Bay Street). Historically, the riding was one of the few in central Toronto where the Progressive Conservatives usually did well. The PCs held the riding for 34 of the 58 years from 1935 to 1993. However, it has been in Liberal hands without interruption since 1993. The 2012 federal electoral redistribution shifted much of the wealthier northern part of the riding, which included Rosedale, to the new riding of University—Rosedale. The riding was represented by former interim Liberal leader Bob Rae after the federal by-elections of March 17, 2008. Rae resigned from Parliament on July 31, 2013. Centre Toronto riding was first created in 1872 from portions of West Toronto and East Toronto. In 1903, the name was changed to Toronto Centre. In 1924, the riding was broken into Toronto East Centre, Toronto West Centre and Toronto South. A riding covering much the same area was created in 1933 named "Rosedale" after the wealthy neighbourhood of Rosedale. This riding was replaced with "Toronto Centre—Rosedale" in 1996, but the quickly growing population resulted in large areas being shaved off on all sides. In 2003, Toronto Centre—Rosedale was abolished, and a new riding somewhat to the east was created named "Toronto Centre". Each of the four major national political parties (the Liberal Party, the Conservative Party, the Green Party, and the NDP), have active federal and provincial riding associations which act as the local party organizations in the riding. Since the early 1990s, however, most contests have been between the Liberals and NDP. This riding lost territory to University—Rosedale and Spadina—Fort York, and gained a small fraction of territory from Trinity—Spadina during the 2012 electoral redistribution. This made Toronto Centre the smallest size riding in the country, beating Papineau in Montreal by 3 km². Religions: 47.2% Christian (22.9% Catholic, 6.0% Anglican, 3.3% United Church, 2.7% Christian Orthodox, 1.4% Presbyterian), 7.7% Muslim, 3.9% Hindu, 3.7% Jewish, 2.3% Buddhist, 34.0% None. By-election due to the resignation of Bob Rae. "November 25, 2013 By-elections". Elections Canada. November 26, 2013. Retrieved December 14, 2013. "November 25, 2013 By-election – Financial Reports". Retrieved May 9, 2014. On September 21, 2008, Conservative candidate Chris Reid resigned because he said he couldn't commit to four years in government. However, blog entries were discovered that linked him to controversial musings on guns and the murder of Tim McLean aboard a Greyhound bus. Chris Reid was replaced by David Gentili as the Conservative candidate for Toronto Centre. Expenditures listed for Gentili include expenditures reported by Reid. A by-election, held on March 17, 2008 to fill a vacancy created by the resignation of Bill Graham was won by Liberal Bob Rae, a former Ontario NDP Premier. The nominated Conservative candidate in the by-election, Mark Warner, was dropped by the party's national council on October 31, 2007. Don Meredith was nominated as the Conservative candidate in December 2007. Activist El-Farouk Khaki ran for the NDP and Chris Tindal was the Green Party of Canada candidate. Liz White was the Animal Alliance Environmental Voters Party of Canada candidate, and Doug Plumb represented the Canadian Action Party. Note: Progressive Conservative vote is compared to "National Government" vote in 1945 election. Note: Conservative vote is compared to Unionist vote in 1917 election. Note: Unionist vote is compared to Liberal-Conservative vote in 1911 election. Note: vote compared to 1904 election. Note: vote compared to 1874 election. "(Code 35093) Census Profile". 2011 census. Statistics Canada. 2012. Retrieved 2011-03-03. ^ "Toronto Centre boundaries description, 2013 Representation Order". Elections Canada. Retrieved 13 August 2014. ^ Wingrove, Josh (11 July 2013). "Bob Rae sets departure date as First Nations work picks up". The Globe and Mail. Retrieved 11 July 2013. ^ "Bob Rae quits as MP in 'very emotional' decision". CBC. 19 June 2013. Retrieved 11 July 2013.